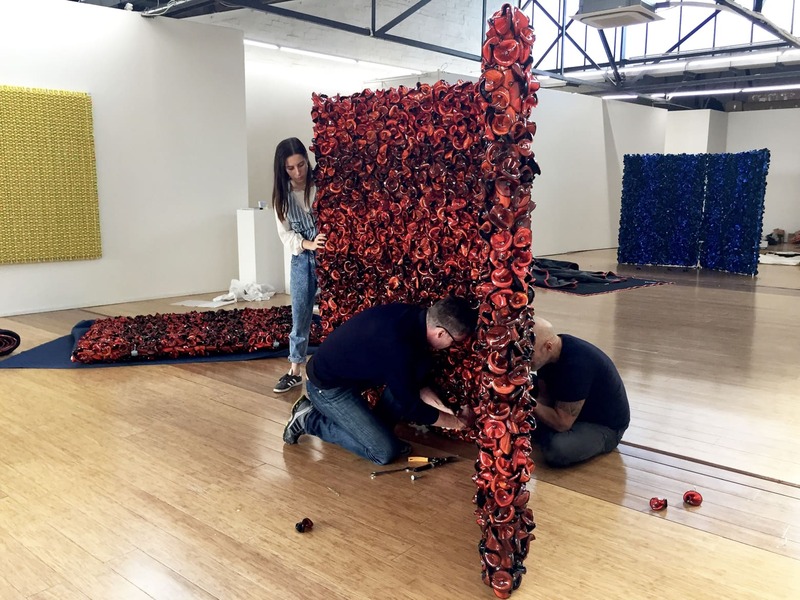 Dominik Mersch Gallery offers three month internships that are project-based and dedicated to providing dynamic, hands-on experience for a tertiary student or recent graduate who is passionate about contemporary art. The internship provides an opportunity to assist with gallery operations for two days per week. Responsibilities may include assisting with marketing, curatorial and administrative tasks, liaising with visitors, and ultimately helping to realise our exhibition and fair program. For more information about currently available positions, please contact the Gallery Manager, Alanna Irwin, on [email protected] and include your CV as well as a brief personal statement. Installation of Dani Marti’s free-standing three panel work ‘Red on Red’ in May 2018 with Dominik Mersch, Lucy Deverall and the artist.